This very composed alpha includes upper case letters A to Z, numbers 0 to 9, and symbols. Also included in More Smarter the kit. The Quick Learnin' Elements & Clever Papers bundled up nice and warm as a kit - now with a brand new alpha! ​Each pack is also available on it's own. Looking for something other than the run-of-the-mill staple to "attach" your photos and elements to your page? They try my playful Washi Tape Strips no. 3! This pack contains 21 unique pieces (and clusters) of tape in bold color choices and patterns. Perfect for documenting everything from yummy summer cones to your stash of back-to-school supplies, these bits of tape will add a fashionable edge to any page! Washi tape is also a nice simple way to add a bit of color to your Project Life album. Use them one at a time for a realistic look, or stack and layer them underneath elements for a bit of colorful flair! Coordinates perfectly with September's BYOC! Looking for more coordinating products? Then try out my Washi Tape Strips, Washi Tape Strips no.2, and School Time: Papers. The Marigold templates are designed in the spirit of play with paper, stories of learning, and the richness of the every day moment. This set is perfect for any schooly page, any autumn-y page, every day page or any page for which you hope to show off papers. A smattering of embellishments that include such randomness as pockets, flowers, trim, and other pretty thingies. 12 eclectic papers to smarter up your layouts!! The Trellis collection is a colorful, happy, and mixed media, fabric-y collection of 18 different borders/trims. From painted zippers to paper chevron to denim and eyelet and back again, these trims can be used alone or in combination to dress up your pages and papers, frame photos, or add that extra touch of hand-crafted whimsy to any layout. Made to coordinate with the fabulous Wicked Smarter September 2012 BYOC collection here at The Lilypad but can be used with any variety of product lines and palettes. Stop by the Plant Your Story blog to keep up with the latest news and happenings! Stringbats are back, this time with a bit of back to school flavor!! These fun hand-stitched yarn shapes will add a touch of whimsical crafty flair to your pages! There are also multi-colored versions of the owl and the apple, each in 3 variations! A total of 76 pieces! These little cuties were designed to coordinate with the Wicked Smart Lilypad collab and the September 2012 BYOC. Don't miss my other two BYOC packs - Torn Tape Dates 1 and Shabby School Papers! Shown in preview at 80% relative to 12x12 canvas. Created at 300 ppi. No drop shadows. Shabby School Papers includes 20 lightly textured, slightly creased 12x12 background papers for your back to school enjoyment! There are 10 solids and 10 patterns - 3 lined papers (elementary, notebook, and legal-ish), 4 grid papers (standard, ledger, and 2 circular), cork, argyle, and a map! These papers were designed to coordinate with the Wicked Smart Lilypad collab and the September 2012 BYOC. Don't miss my other two BYOC packs - Torn Tape Dates 1 and Stringbats 2 – School! Created at 300 ppi. No drop shadows. Stick that date! Torn Tape Dates 1 are a fun way to add a date to your pages! The tapes are slightly transparent and imperfectly torn at both ends. Some pieces may have parts of characters torn off or may show parts of adjacent months/numbers. Set includes months (English only), numbers 1-31, and years 2011-2020 in 10 colors/variations each! Torn Tape Dates 1 were designed to coordinate with the Wicked Smart Lilypad collab and the September 2012 BYOC. 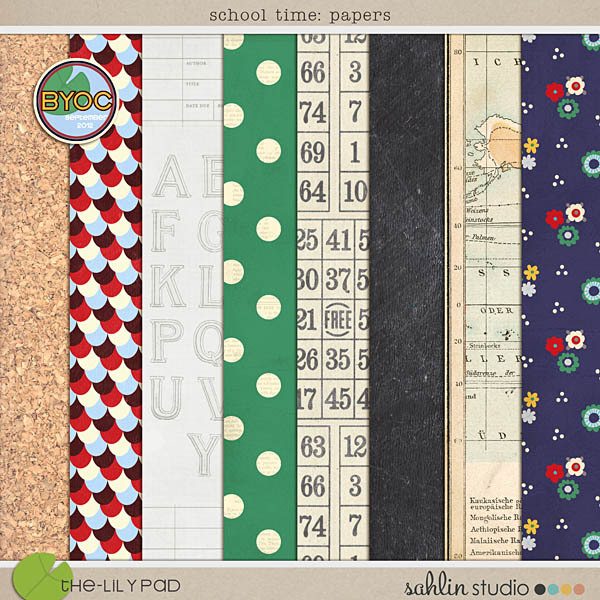 Don't miss my other two BYOC packs - Stringbats 2 – School and Shabby School Papers! Shown in preview at 100% relative to 12x12 canvas. Created at 300 ppi. No drop shadows. Updated 9/15/15 to include years 2015-2020. Contact me for additional files if you have previously purchased this product. A set of 6 messy, painty, sketchy conglomerations that coordinate with the September BYOC.